Powered by Untappd. Beer Match is not affiliated with or endorsed by Untappd. If you think this project is cool, please become a Untappd supporter. The color pallete used in Beer Match is inspired by this. BEERxMATCH is optimized for a wider screen (desktop/laptop/tablet) due to the design of the visualizations introduced on the site. BEER IS GOOD and FUN TO EXPLORE. 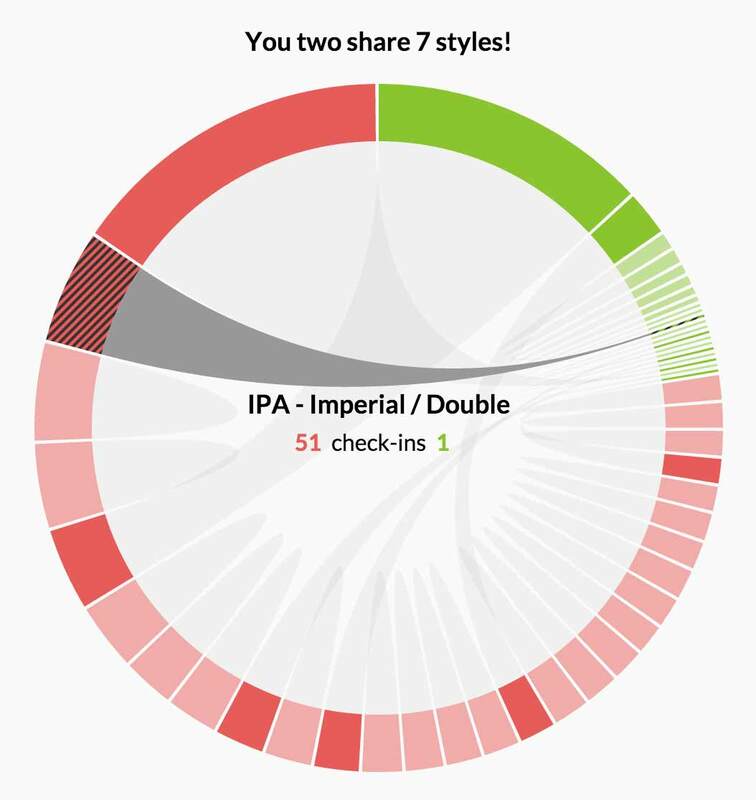 BEERxMATCH is a web application that visualizes personal beer check-in data from an iPhone/Android app Untappd. With Untappd, you can check in beers you drink: search your beer and rate it up to 5 stars. When you check in, timestamp is also saved and you can tag a location where you drink.Each check-in data includes meta information of the beer such as style, ABV, brewery, and the origin country. Harnessing these personal beer drinking data, BEERxMATCH analyzes these data and shows "quantified self" beyond the timeline on Untappd. With BEERxMATCH you can learn more about your everyday life around an interesting but otherwise hidden subject (i.e., beer drinking!) and to examine the comparison between you and and your friends' behavior. 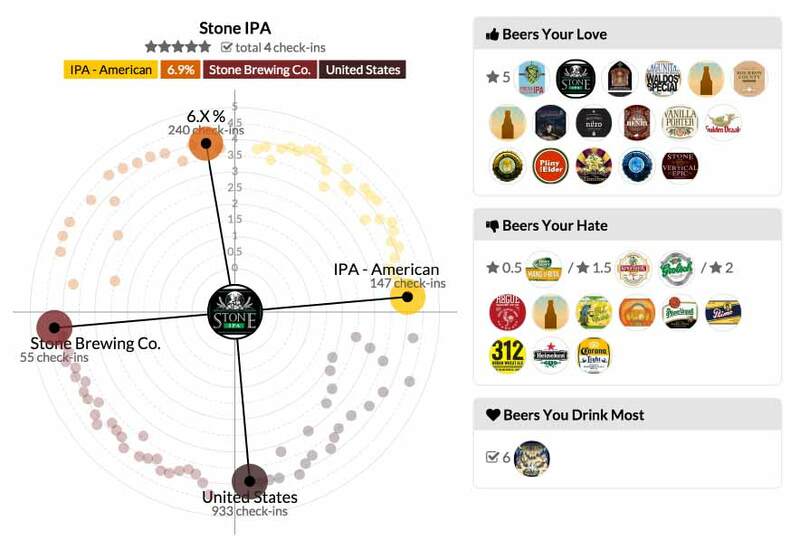 VISUALIZE YOUR BEERS and EVEN FRIENDS'. BEERxMATCH showcases two views, Single and Match, each of which has a series of visualizations. See some of the visualizations! You may, first of all, be curious how much you drink although you can roughly guess. Check out the daily, weekly, and monthly trend. Play with the context - style, ABV, brewery, and the origin country - of the beers you love or hate. On which days are you a more social drinker? How much did you drink when you traveled? HOW WELL DO WE GET ALONG? See your match with your friends in terms of beer taste. 100% is the beer soul mate. Also compare your drinking behavior. Side-by-side visualization of you and your friends: Examine by day or hour, in bars or bubbles. Differences in check-in counts visualized in chord chart. but WE DON'T KEEP or SHARE YOUR DATA. BEERxMATCH (BM) uses Untapped API to acqure Unatappd users' data. As long as you do not keep your Untappd account private, BM can have an access to your data. BM does not store the data downloaded from the API in BM server. Instead, BM temporarily downloads the data and analyzes it, creates a new dataset, and send it to your browser. The browser keeps the data as local storage that stays for two weeks. Thus if you're using BM on a public computer, make sure that you delete your data after playing with the site. To delete your dataset, click the trash icon on top of the visualization pages. No public venue data exist.